Tonight is the finale of Season 2. We'll miss our friends at Downton Abbey. It's going to be another long year waiting for Season 3. Episode 6 found Matthew walking again (indeed, the tingling was in his legs), Lavinia succumbing to the Spanish flu (with Cora and Carson surviving it), and Thomas uncharacteristically behaving well (for the moment anyway). In romantic news, Mr. Bates and Anna tied the knot and gave us another Downton love scene (which we might have done without really), Robert and the housemaid Jane shared some awkward kisses (which we definitely could have done without—but she's leaving Downton in any case), and Lady Sybil and Branson shared plans for their departure to Ireland. In meanness news, Ethel and Charlie met his grandparents and grandpa was not amused, and we thought Lady Mary was way harsh badmouthing Carson when he decided he couldn't work for Sir Richard. At the end of the episode, Bates was arrested for the murder of his ex-wife Vera. 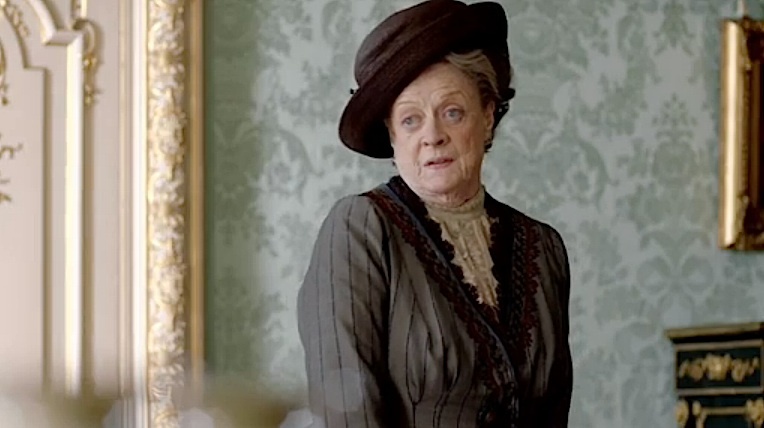 As usual, the Dowager Countess brought a level of sanity and the best lines. "Don't be defeatist, dear. It's very middle class." It's Christmas at Downton 1919. Here's a preview of tonight's episode. Watch Downton Abbey Season 2 Episode 7 Preview on PBS. See more from Masterpiece.